Remove any skin or bones from the hot smoked salmon. Flake with a fork or fingers. 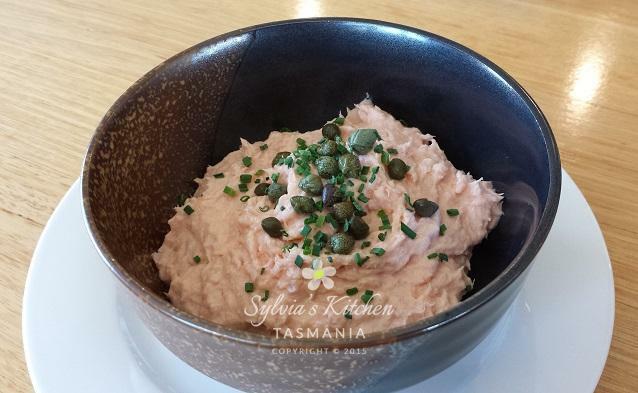 Place the hot smoked salmon, sour cream, tomato paste and ham in a small food processor bowl. Add salt and lemon juice to taste. Pulse until smooth. Place the pâté dip into a bowl. Garnish with baby capers and finely chopped chives. Serve with crackers or sliced baguette and it’s done! If you’re at the shack for holidays, you can still prepare this recipe – mash it all together in a bowl with a fork and it’s done! This entry was posted in Autumn, Gluten Free, Local Produce, Recipes, Spring, Summer and tagged Anzac Biscuits, Local Produce.